Crawling out of the Blast Crater: Who Owns History? Richard Lacayo has reflected on the recent return of antiquities to Italy and asks the question, "Who Owns History?" (Time, February 21, 2008). Through the 1970s, the 1980s, and the 1990s, museums (and private collectors) in North America (and in Europe and the Far East) acquired antiquities that had been recently looted from sites in Italy. And then the Italian authorities asked for them back. Not because the returning pieces could be given back their contexts when displayed on Italian soil. But because (some) museum directors, (some) curators, (some) dealers and (some?) collectors did not believe that acquiring recently surfaced archaeological material had a direct link with the destruction of archaeological sites in Italy. In the months that followed, one museum after another went through something like the Elisabeth Kübler-Ross stages of accepting death. They bridled, they denied, they negotiated. Finally, they came to terms. In the case of the Getty, it agreed to return 39 objects in short order but got a temporary reprieve on the goddess until 2010. So are we entering a new era? I'm betting now it will be a long time before a U.S. museum director buys another ancient treasure with a wink and a nod or anything less than a documented-ownership trail longer than an Old Testament genealogy and much more credible. But why acquire when you can have long-term loans? the ordinary museumgoer, who has a crucial stake--being able to see the widest spectrum of culture that humankind has produced. Indeed "the ordinary museumgoer" should feel distinctly uncomfortable when archaeological material loses its context that can never be recovered. We do not know the last resting place of the Sarpedon krater --- and that is a loss to human culture. Looting has intellectual consequences. But Does Lacayo get sidetracked by the ownership issue? Should the bust of Nefertiti be in Cairo or Berlin? 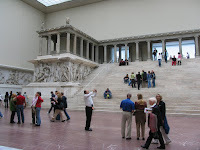 Should the Pergamon altar be in Turkey? Are the Parthenon marbles best displayed in a purpose-built museum that has a visual link with the Athenian akropolis? But in one sense there are no intellectual consequences linked to a decision to transfer ownership. Nefertiti was found in a sculptor's workshop at Amarna. The Pergamon altar dominated the skyline of the Attalid royal city. The Parthenon was constructed during the 440s and 430s BCE. But we do not know where the acrolithic female statue of "Aphrodite" acquired by the Getty was found. Where was the tomb in which the ex-Princeton's red-figured psykter was placed? This information is lost. There need to be solutions and Lacayo rehearses the issues of partage and leasing. But he is wrong about one thing. It was not the "Rutelli campaign" that created the "blast crater" from which these North American public institutions are now emerging. It was the greed and short-sightedness of (some) museum curators, (some) directors, (some) trustees, and (some ?) benefactors who wanted to "own" part of antiquity.